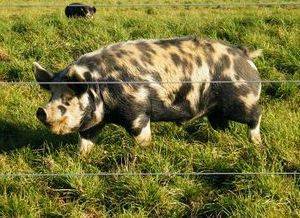 Idaho Pasture Pigs (also known as IPPs) were developed from Duroc, Old Berkshire, and Kunekune pigs. They are grazing pigs and are very gentle, have great personalities, are easy to work with, and are smaller than traditional pig, like the Large White, while still reaching a butcher weight of about 200 - 250 pounds in 9 - 10 months eating primarily grass. They are a well-proportioned pig with a medium width in the leg set, a wide back, noticeable shoulders, developed hams, and a overall, nicely proportioned head with a short - medium upturned snout.Sows should mature at 250 - 300 pounds and the boars should mature at 300 - 400 pounds.